This is available again! 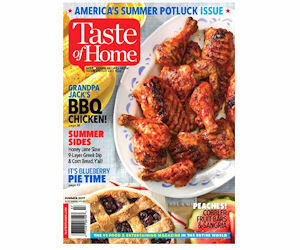 Sign up to begin a free subscription to Taste of Home magazine! Taste of Home magazine is one of the top cooking and recipe magazines in the world. Each issue contains more than a hundred recipes along with tips for creating new recipes from ingredients you already have on hand. Whether you cook for a crowd or just yourself, you will find ample ideas inside each issue!